Fantastic stuff guys. Thanks for sharing! 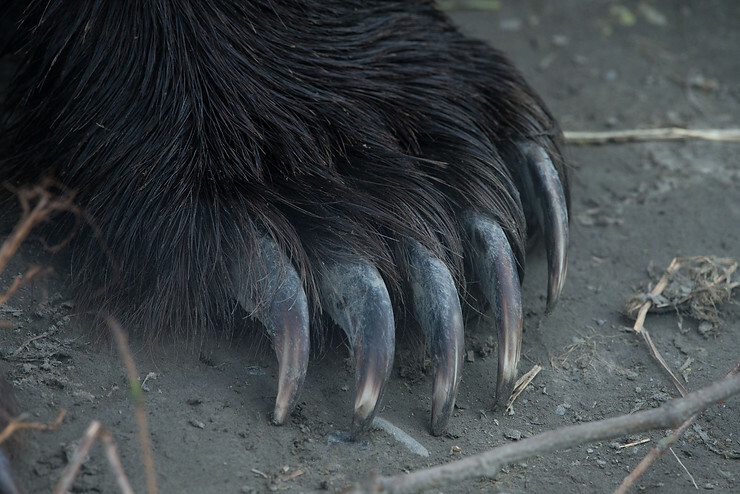 Before traveling up through the Yukon and Alaska, we heard that bears were everywhere. People reported seeing them constantly, often without even trying. 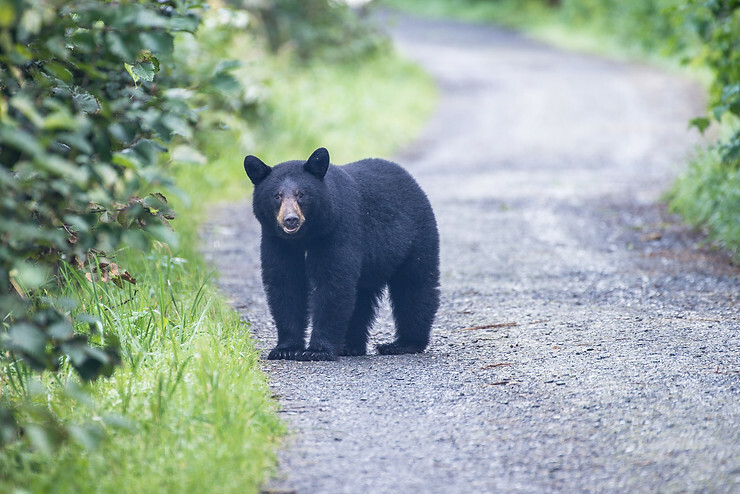 Bears on the roadway, bears in campsites, bears on the trails. Having never seen a bear in the wild, we were pretty excited for this. Yet, somehow, we managed to make it all the way through the Yukon, Fairbanks, Anchorage, and the Kenai Peninsula without more than one fleeting bear sighting. 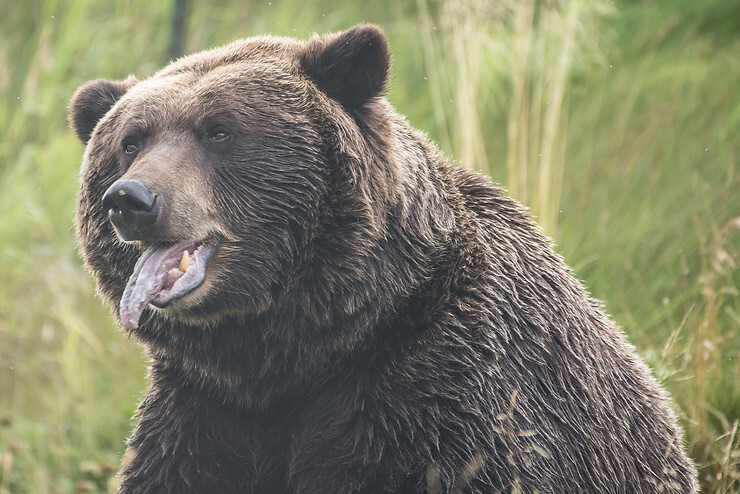 On our way back up to Anchorage from the Kenai, we decided to ensure ourselves an amazing bear experience and stopped at the Alaska Wildlife Conservation Center in Girdwood. 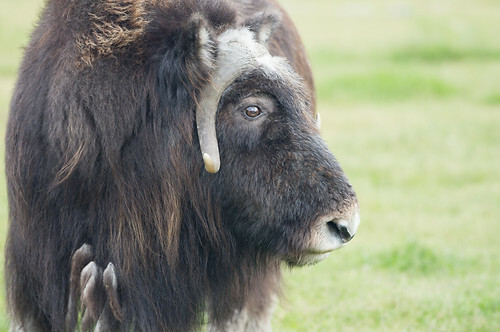 The AWCC is a self proclaimed sanctuary dedicated to preserving Alaska's wildlife through conservation, education, research, and quality animal care. They take in orphaned or injured animals and give them a lifetime of care. It's not constructed like any zoo you've been to. 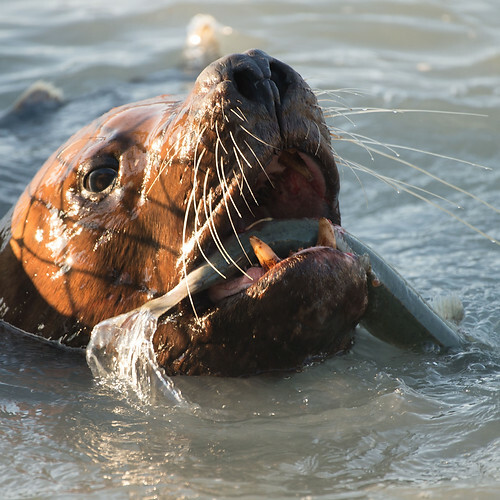 Each animal group has a large, natural habitat enclosed mostly by wire fencing and are encouraged to be themselves. They offer tours and drop in feeding times to get a better look at different animals, although we had no issue seeing the grand majority of them without it. To top it all off, it's only $15 to visit! 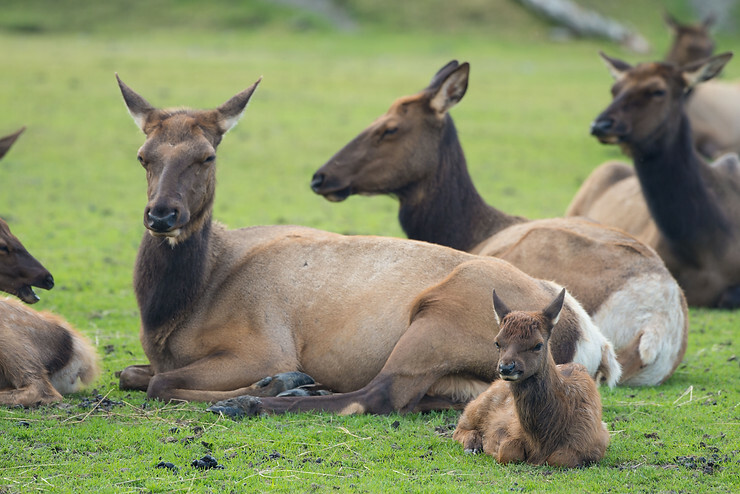 The center has a wide variety of animals, including brown and black bears, moose, reindeer/caribou, wolves, elk, deer, bison, etc. 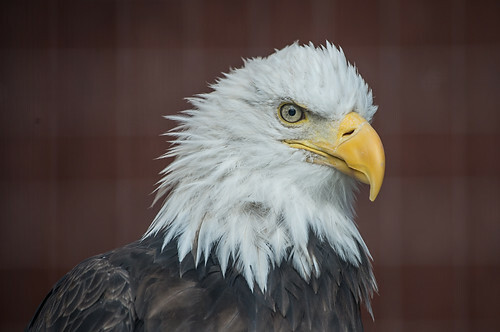 Although commercial photography is prohibited, you can capture some amazing close up photos for your personal collection. Check out our favorites from our visit! This big guy right here wasn't having the best day when we arrived. He was in the middle of shedding his velvet and he was itchy and agitated. 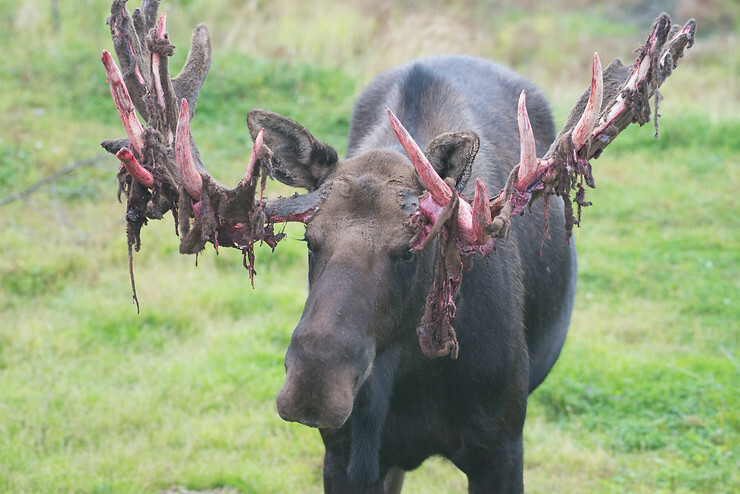 He was trying to rip the velvet off using the fencing of his enclosure, and was getting so aggravated that the staff decided to block off the more approachable sections of the enclosure and distract him with food. 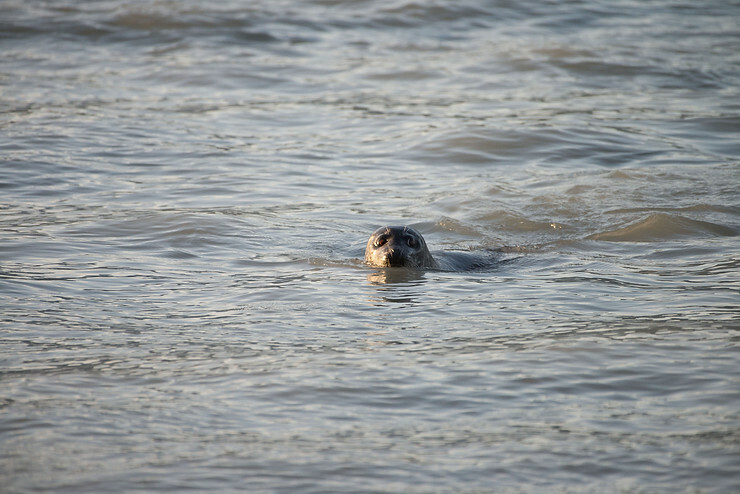 It seemed to work eventually, as he calmed down and we were able to get within a nice distance of him. This was our favorite enclosure, of course; our main attraction. 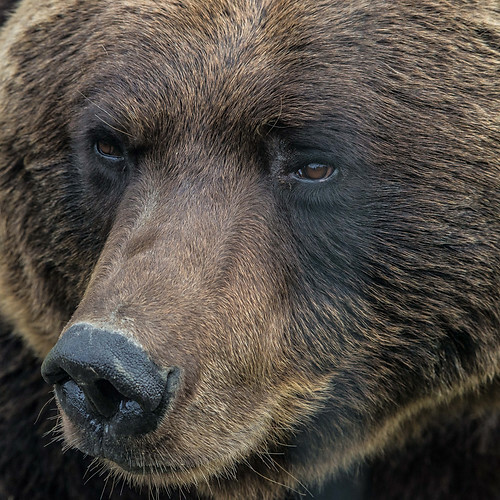 There were three brown/grizzly bears living in the enclosure; two females and a male. 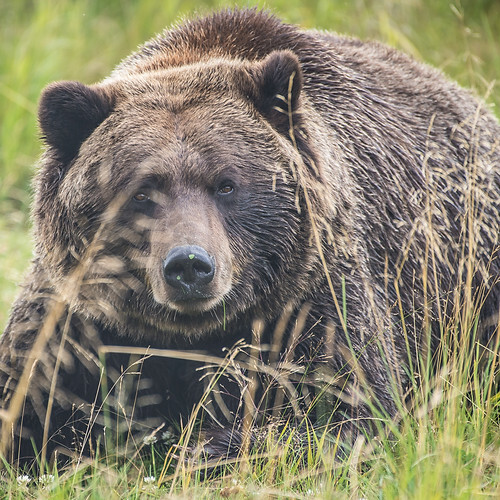 For those who don't know, the brown bear and grizzly bear are the same species, but the name differs based on their geographical location. 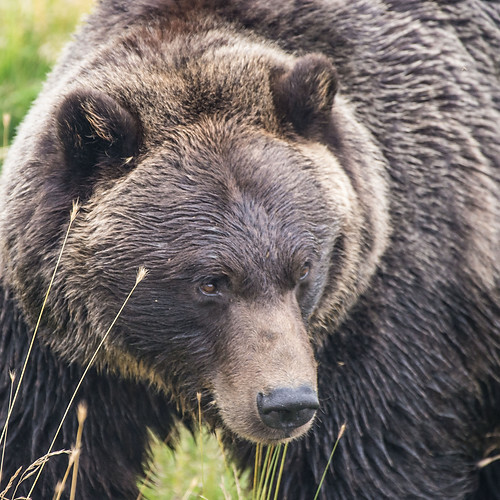 Brown bears live near the coast, while grizzlies live inland. 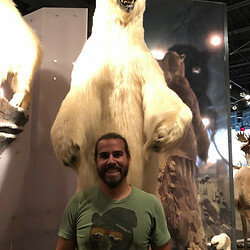 We were thrilled to get as close to the bears as we did. 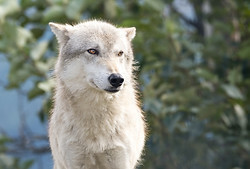 They were majestic and beautiful, with deep soulful eyes and claws that could slash you open in a heartbeat. 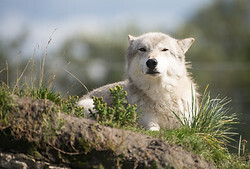 Of course, despite being alpha predators, they also have a goofy side that is probably rarely seen in nature. 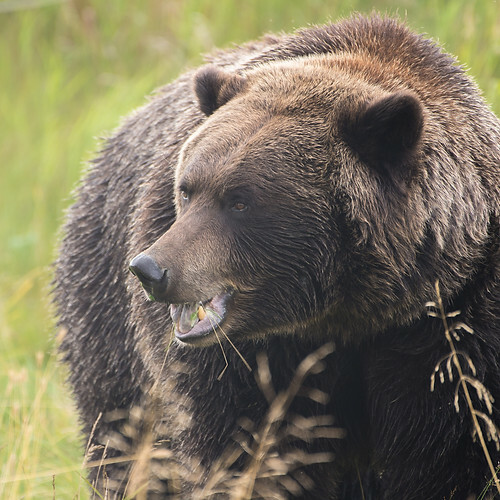 Luckily for us, one of the grizzlies was feeling like a real ham that day. There were a few wolves at the sanctuary, and they put on a fun show for us. 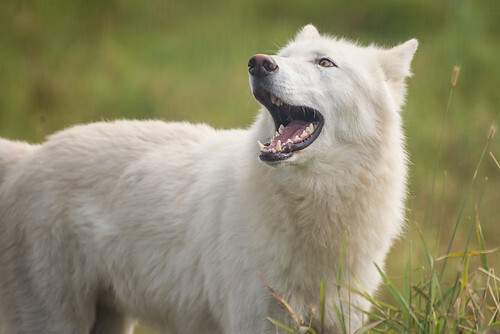 The pure white wolf kept trying to get the female to come down from atop the structure with playful actions, and more than once all the wolves joined in a howl. 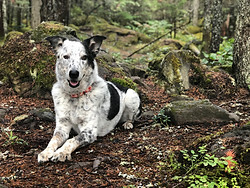 Honestly, in a place like this, with so many cool animals and rescue stories, there just isn't enough space in a single blog post to capture the magic. I'd try, but it wouldn't do it justice. It's an awesome place. Trust me. Just go. You wont regret it. And this is coming from a person who hates zoos. 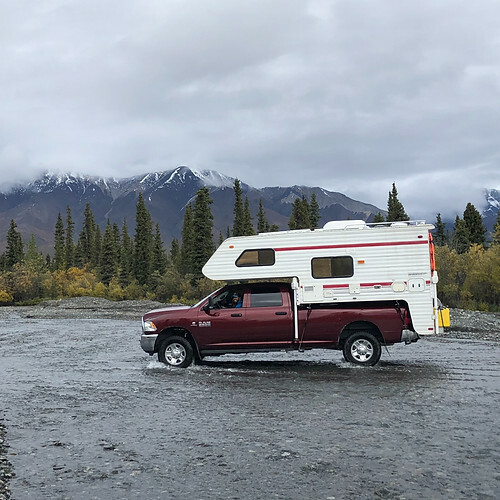 With our time on the Kenai peninsula having come to an end, we trained our sights on south east Alaska, namely Valdez (pronounced Val-deez) and Wrangell St. Elias National Park. While it is tempting to skip both of these stops given their remote locations, I can assure you it is well worth the detour. Valdez, best known for the Exxon Valdez oil tanker spill in 1989, is a small fishing and shipping port tucked into a remote cove off of the coast of Alaska. 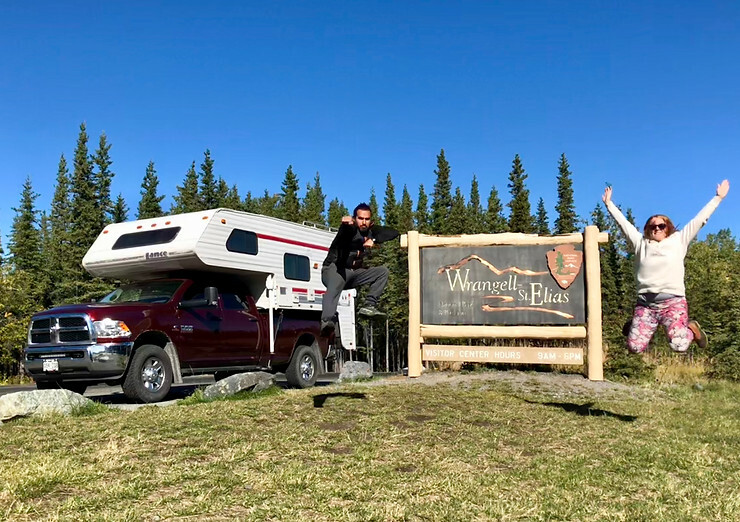 It is a two hour detour from the main road and is accessed by the Richardson Highway that weaves through the mountains, over snowy passes and by glaciers. 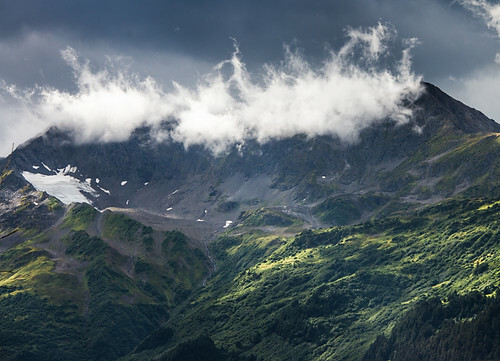 Fun fact, Thomson Pass, which is the large mountain pass you must traverse before heading down into Valdez, is the snowiest place in the state. In the winter of 1952 it received 80 feet of snow. Yes, 80 feet. Come prepared as it can snow here in almost any month of the year. Anyway, the drive itself is pretty spectacular and we were rewarded with some early fall foliage and road side waterfalls. 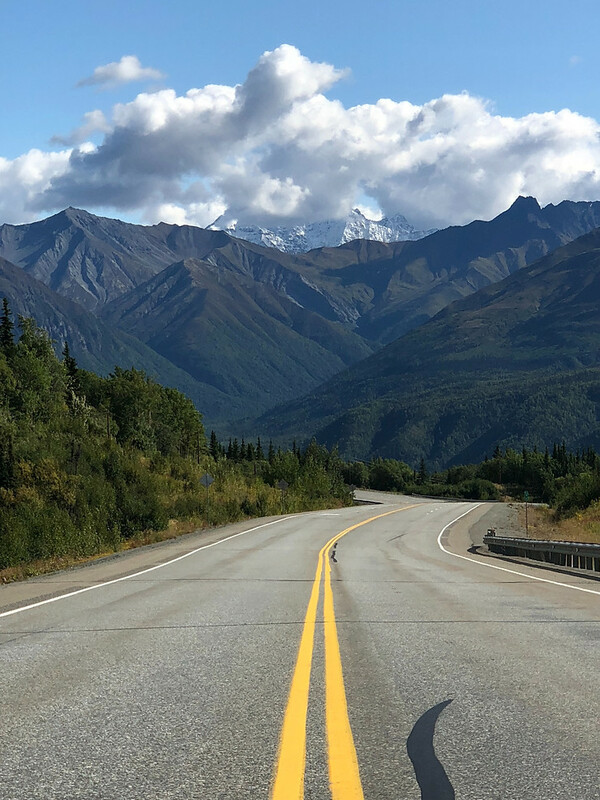 For history nerds, the Richardson highway was Alaska's first road and it was completed in the early 1900s as a route for gold prospectors to connect Valdez to Fairbanks. 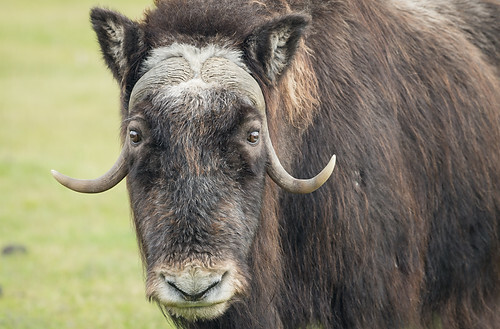 It was all part of the US Government's plan to justify the purchase of Alaska from Russia. The initial trail was a 5 foot wide foot path hacked through the dense vegetation by destitute prospectors armed with machetes. In 1910, it was upgraded to a wagon road by its namesake, Army Captain Wilds P. Richardson, and the rest is history. Anyway, it was a very beautiful way to spend a few hours behind the wheel. 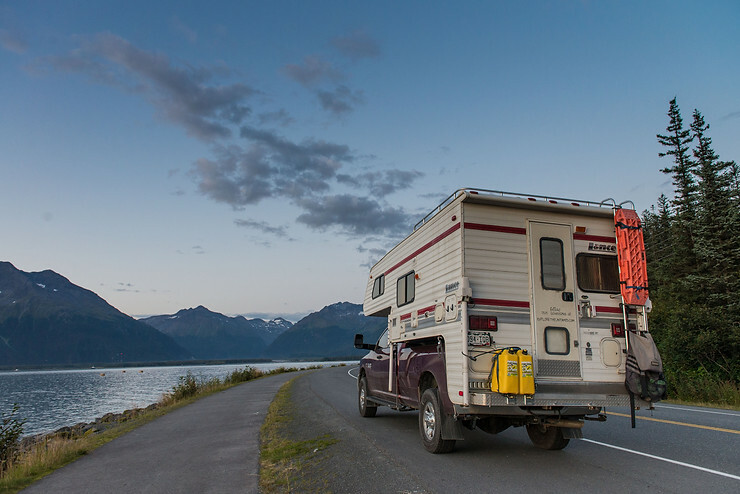 Rolling into town, we spent our first night at the mouth of the Valdez Glacier. It was a pretty cool setting (not to mention free! ), the blue glacial ice cascading down the mountain with an open lake at the bottom, icebergs floating all about. If you were to bring a kayak along it would make for a nice adventure, if you didn't, some of the outfitters in town offer kayak tours. With a brisk night in the books, we headed downtown the next day to check things out. It is a very small and quaint town along the waterfront with a few small shops and restaurants to satisfy the masses. We wandered around for a bit to familiarize ourselves with town and what it has to offer. Stop number one was the fish hatchery on the other side of the cove. It is neat in its own right and the work that they do helps to sustain an entire community and ecosystem. Take the informational walking tour that wraps around the building so you can see the lifespan of the salmon that come here to spawn and send another generation back to sea. We originally came for the grizzlies but stayed for the marine life, which was good of course since there were no grizzlies to be found. Instead, we were treated to a wonderful display of marine and avian biodiversity. There were no shortage of animals, and, in no particular order, we saw seals, otters, bald eagles, salmon, sea gulls, and my favorite, the sea lions. Now, the design of the facility meant that a portion of the salmon population would not make it up the salmon ladder to spawn and would instead be marooned at the mouth of the river, floundering about. 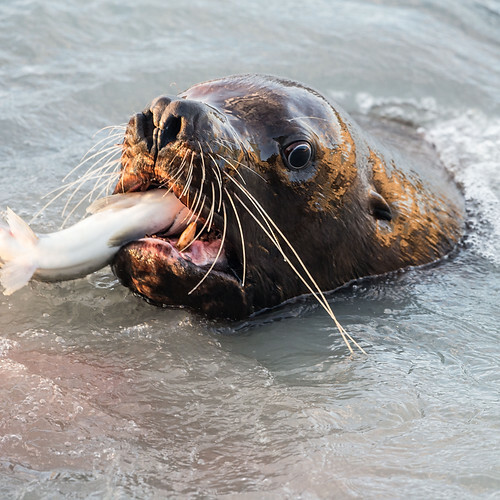 This crush of salmon inevitably leads to predators, and none were as ferocious and hilarious as the sea lions, with one in particular providing most of the entertainment. We dubbed him Brutus, and over the next few days we watched him fumble 90% of the salmon that went into his mouth while the remaining 10% were chomped in half with blood spraying everywhere. It was truly a sight to see. 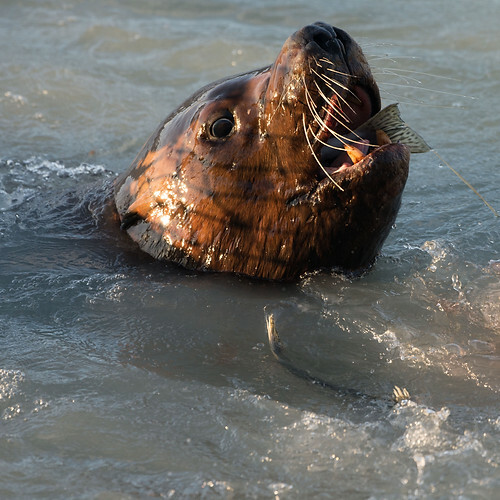 While Brutus was busy floundering around by the salmon ladder, the seals, who were clearly not the alpha predators in this environment, stealthily swam around the perimeter picking off straggler salmon. They operated with an air of precision, never staying in place for very long and working together as a team to ensure everyone was well fed. 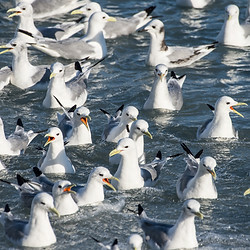 On account of the aforementioned fish carcasses and pieces strewn about, it was, understandably, a haven for birds that feast on the salmon, namely the sea gulls and bald eagles. 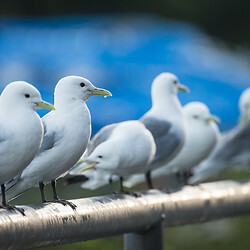 The sea gulls were here, there, and everywhere, flying around, perching on the building and the gates, all of them squawking up a storm that made it difficult to hear yourself think. Every now and again though they would fall silent and scatter. 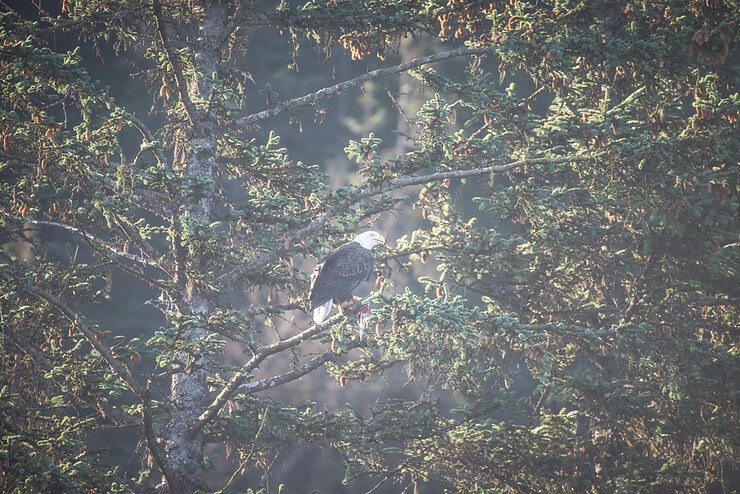 We wondered at first what was the matter until we saw the big bald eagles swooping in to get their share of the feast. 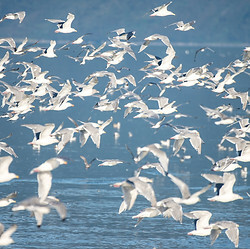 While their numbers paled in comparison to the sea gulls, their presence loomed large over the bird kingdom. 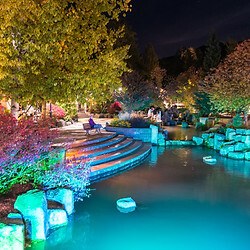 The fish hatchery is also an awesome place to hang out later in the day due to the incredible sunsets. 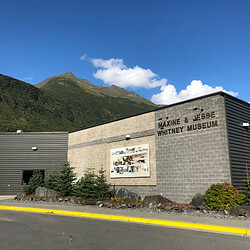 In addition to the fish hatchery, which we spent far too much time at, Valdez also had the fascinating Maxine and Jesse Whitney Museum. 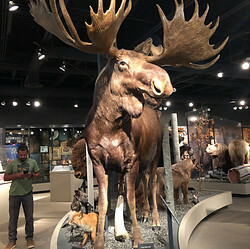 This free museum holds the collection of Maxine & Jesse Whitney, two white folks in the early 1900s that ventured into the bush of Alaska to collect native artifacts. Maxine was a true badass and didn't abide by any of the societal expectations of women in those days. I won't spoil her story, but it's well worth the visit to learn more about this inspirational woman. Another fun encounter came when we took the dogs for a walk around town. 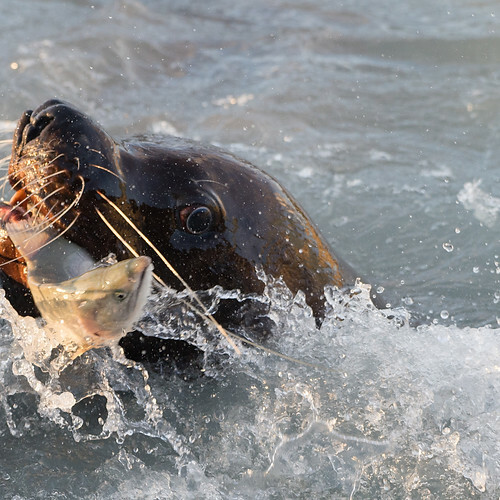 We detoured off into a little park and stumbled across this little guy scavenging for salmon carcasses on the beach. He watched us warily before darting off around the corner. This just so happened to be the way we were walking, so we cautiously followed. Just so happens we rounded a blind corner on the trail and came face to face with him again. He bolted, as did we. As fate would have it, we of course ran into him a third time on the way out of the park where he ran behind a tree and chuffed at us. Not wanting to provoke him we took our pictures and left him to his fishy feast. 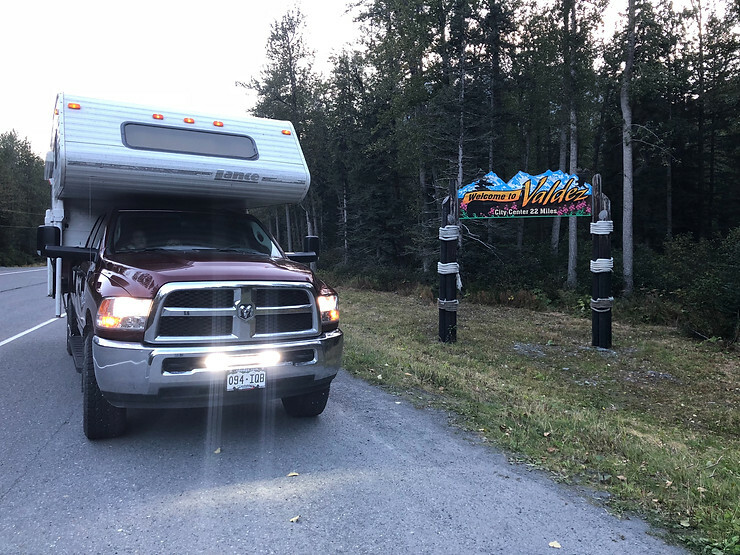 Leaving Valdez, we set our sights on Wrangell St. Elias National Park. 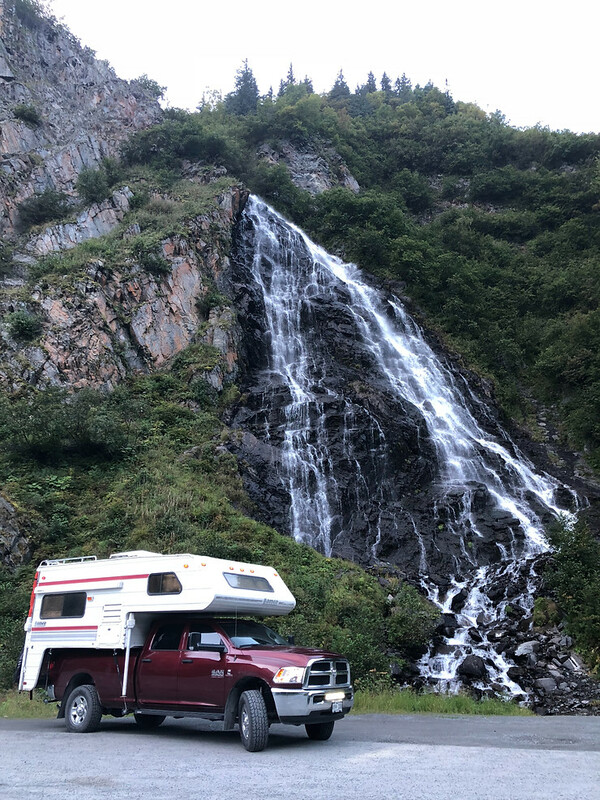 Wrangell is a funny park, there are very few entrances and practically no trails to speak of considering it is America's largest National Park. 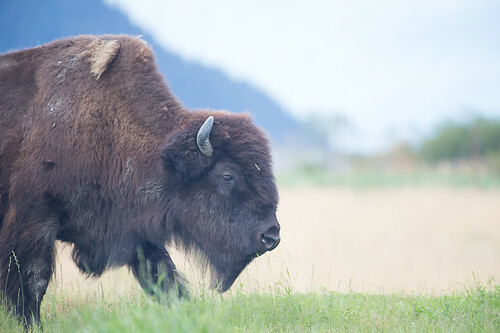 Together with it's neighboring Kluane National Park (Canada's) and Glacier Bay National Park & Preserve, they combine to form the world's largest protected land area, which is awesome. 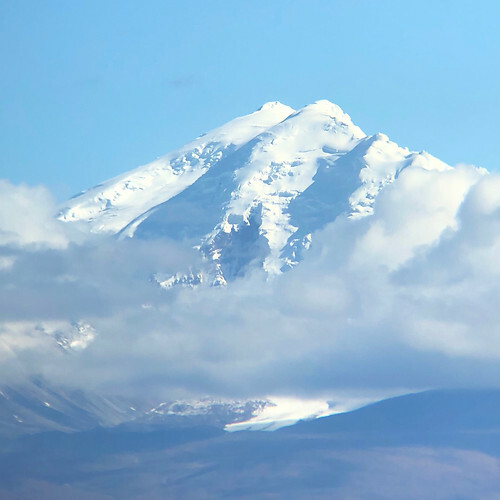 The defining feature of the park is the St. Elias and Wrangell mountain ranges which house the majority of America's highest peaks, both of which feature dormant and active volcanoes. Owing to its remote location, it receives very few visitors annually, many of whom only scratch the surface of a park best seen by the airplane or raft. For those in the area, we heard that the trip to Mccarthy, while rough and slow, is well worth the detour. We chose not to go due to it's remote location, but in hindsight I think we both regretted not taking the opportunity. Oh well! 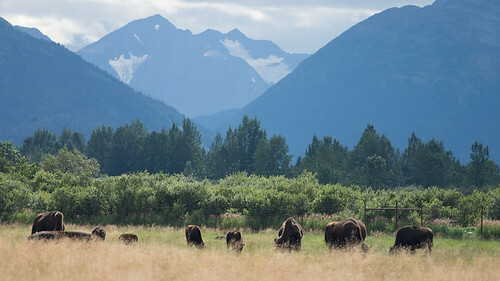 Sadly, our departure from the park marked the end of our time in Alaska. 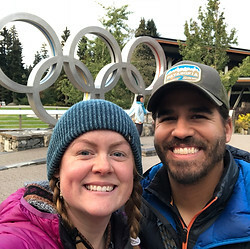 It was a whirlwind six weeks filled with inclement weather, glaciers, mountains, all kinds of wild life and an experience truly worthy of the last frontier. While I wish we could have spent more time there, British Columbia was beckoning and it was time to heed the call. Really great trip reports and the photography is outstanding!! Thank you for sharing, be safe and enjoy the lifestyle!! Thank you! We are lucky enough to have this opportunity, so it would be a shame not to share it. Keep on tuning in as there is plenty still to come. 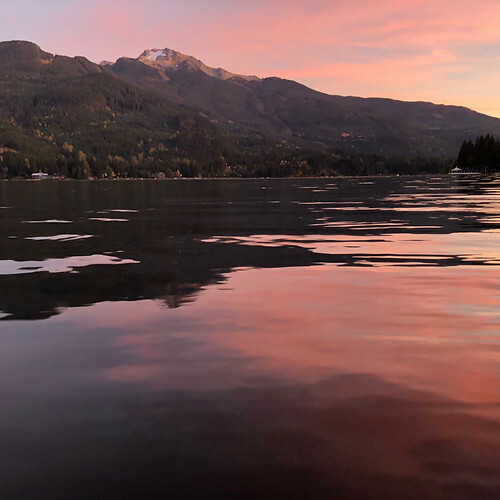 With Bella Coola in our rearview mirror, we set our sights on Whistler and Squamish in lower British Columbia. 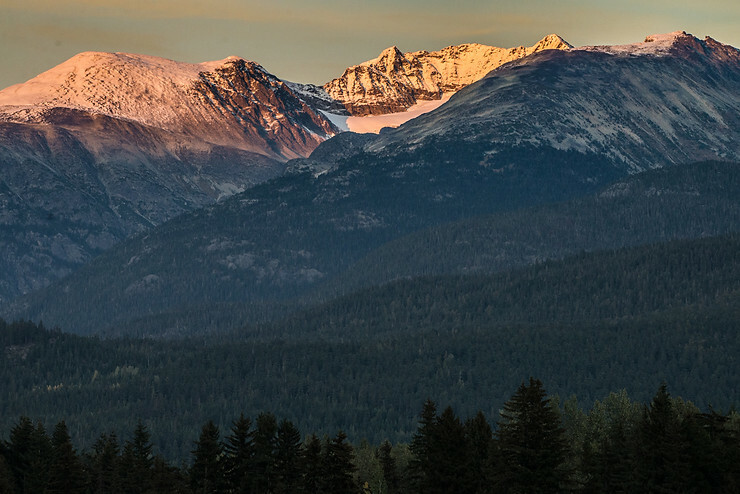 These areas are famous for both their unrivaled skiing (hosted the Winter Olympics) and, more relevant to us, the mountain biking. 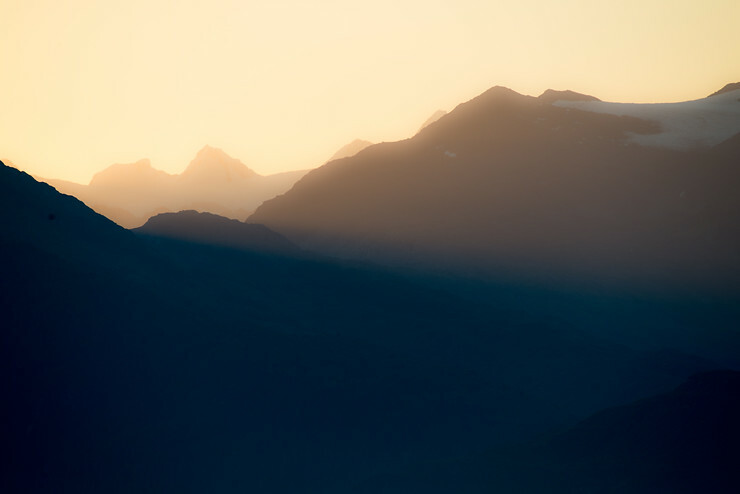 See, since the dawn of mountain biking, both Whistler and Squamish have been on the forefront of the MTB scene. Superstars and pioneers such as Wade Simmons, Brett Tippie, and Richie Schley all hailed from the region. Without their contributions we may have never been introduced to freeriding, been inspired to pedal downhill bikes uphill, or experienced the back wrenching pain of a huck to flat. 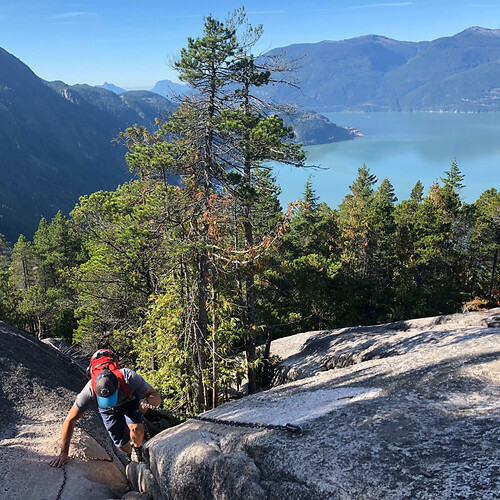 What Hollywood is to acting, British Columbia is to mountain biking, so you might be able to understand my excitement at finally being able to make it after 20 years of dreaming. Before we arrived in Whistler however, we stopped in the lovely town of Pemberton. 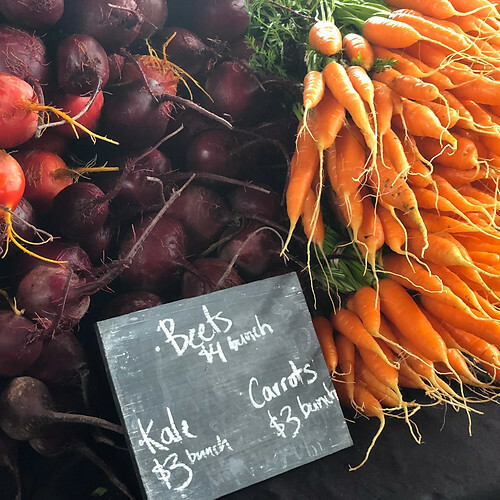 Pemberton is 45 or so minutes north of Whistler and just so happened to be hosting an adorable farmer's market the day we rolled through. Ashley and I spent a good hour and a half browsing the various stands, listening to music, and salivating over all of the gorgeous, fresh produce being offered for sale. This is where we were first introduced to Whistler Elixir, a local purveyor of very tasty kombucha. We highly recommend looking them up if you are in the Whistler area and trying their ginger flavor, its delicious! 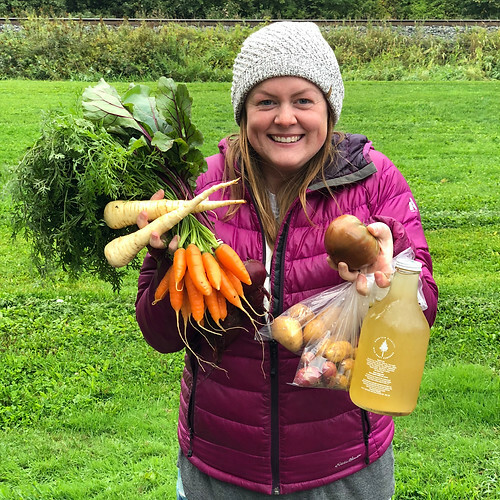 Anyway, we found ourselves walking away with an armful of root vegetables which made the most delicious roasted vegetable medley for dinner that night. 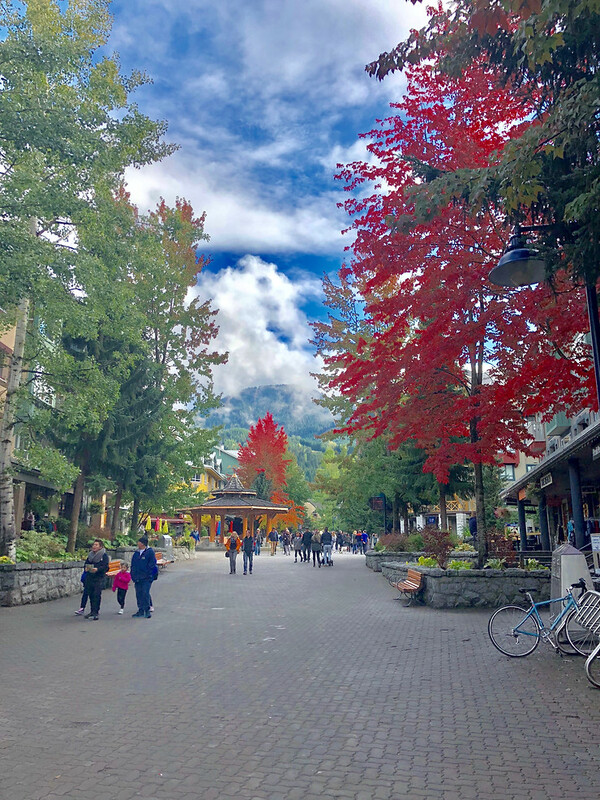 Whistler itself is centralized around the village. The village is a collection of hotels, shops, and restaurants located at the bottom of the mountain, and is the main hub of activity in the area. 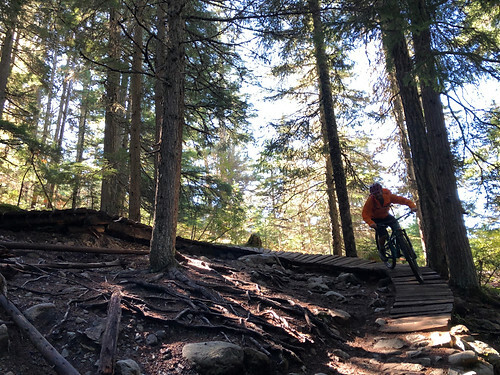 Luckily we arrived during the Fall shoulder season, but it was still pretty hopping with late season mountain bikers and tourists milling about. We probably spent a good couple of days combined wandering about the village, people watching and taking in the sights. Of course we weren't there solely to experience the village life, and before long we found ourselves perusing the mountain bike rentals hoping to score a couple of steeds for the day and get in some miles on the trails. That is where Arbutus Routes came in handy, providing us with a couple of rental Yeti bikes for the day (an SB5+ and a SB100) and a trail map with suggested routes. 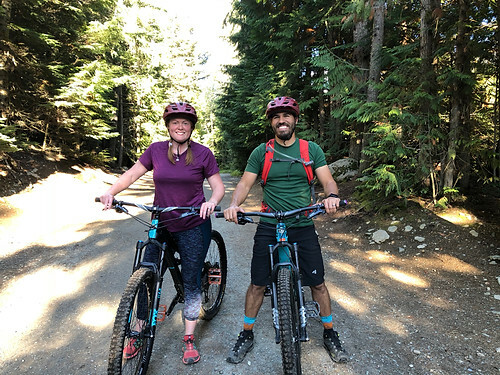 Being that Ashley is more of a novice, we skipped the chairlift and instead focused on the Whistler village trails, a dizzying network of singletrack that weaves through the woods amongst the various area attractions. After only a little bit of climbing, we found ourselves in complete solitude with nothing but the buzz of our hubs piercing the silence. We hit trail after trail, navigating wooden bridges and single track with smiles on our faces. 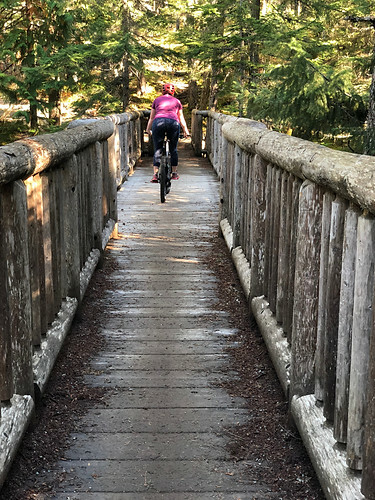 Now, the thing about Whistler is they have trails for almost anyone. 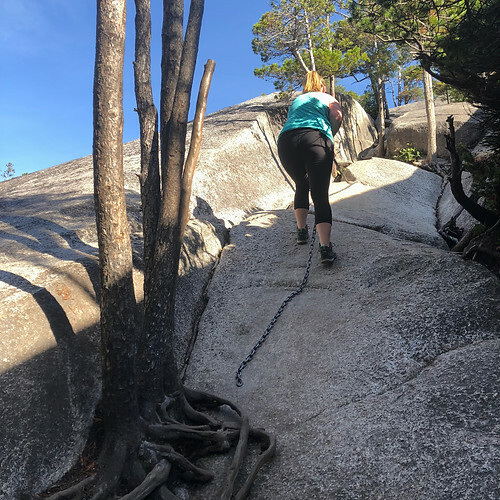 Even Ashley, who can get intimidated when trails get too steep, narrow, or rocky, found herself pleasantly challenged by area. We made the most of it, zipping around and taking full advantage of our half day rentals. The trails live up to their renown and we would highly recommend giving them a shot. With some pedal time under our belts, we decided to get in a little bit of hiking in as well. 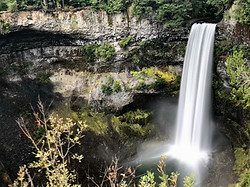 For this, we chose to do the Brandywine Falls trail plus a little bit extra. Brandywine was a cool little stroll, but owing to it only being 0.7 miles from the parking lot was rather crowded, which, if you know either of us know that is not our speed. So we decided to tack on a few more miles and ventured up the Sea to Sky trail to the Whistler Bungee Bridge. Unfortunately, people had stopped jumping for the day, so we weren't treated to any of that, but it was still a neat stroll through the woods. 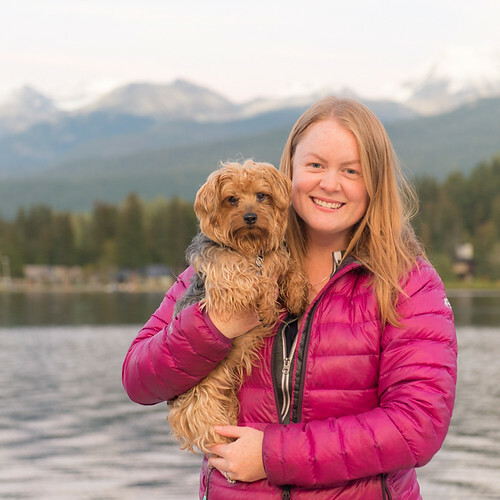 The other fun thing about Whistler was how spectacular the dog park is. 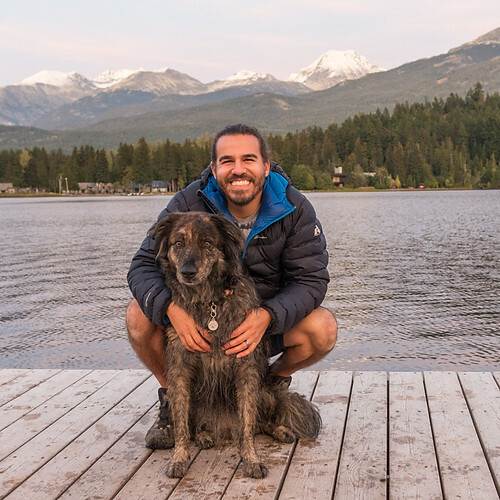 Despite being a little bit out of the way, it is located along the shores of the beautiful Alta Lake. 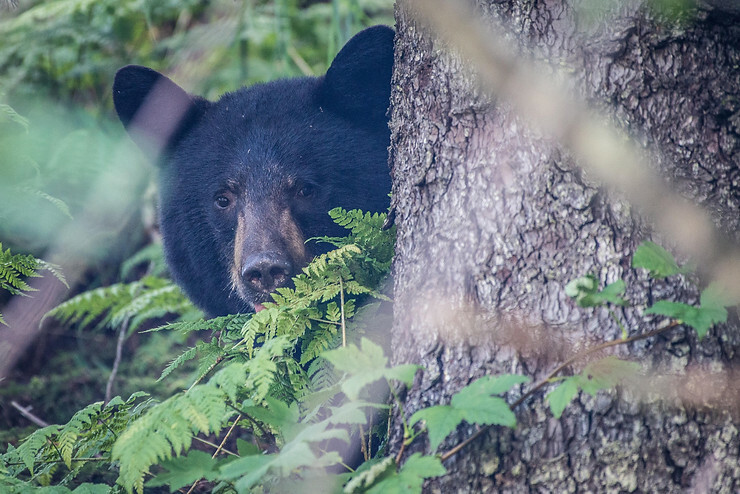 An extra little bit of excitement was injected into our evening when we spied a shy black bear foraging in the bushes for berries. We left him alone and he was courteous enough to do the same. The dogs romped around for a bit before we coaxed them out onto the dock to do a sunset photo shoot. Being dogs, they just wanted to play, and spent most of the shoot trying to jump off the dock into the water. 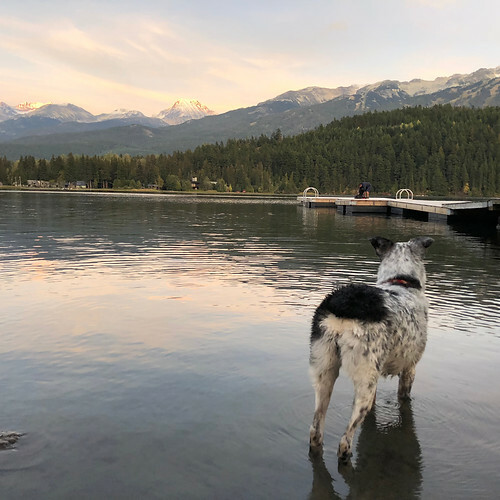 Typical of a dog's life, but we got a few pictures none the less before the alpenglow disappeared. 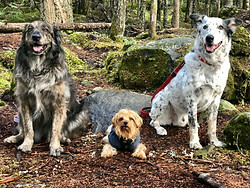 It was in Whistler that our beloved Chewie had her birthday, and we celebrated with treats. 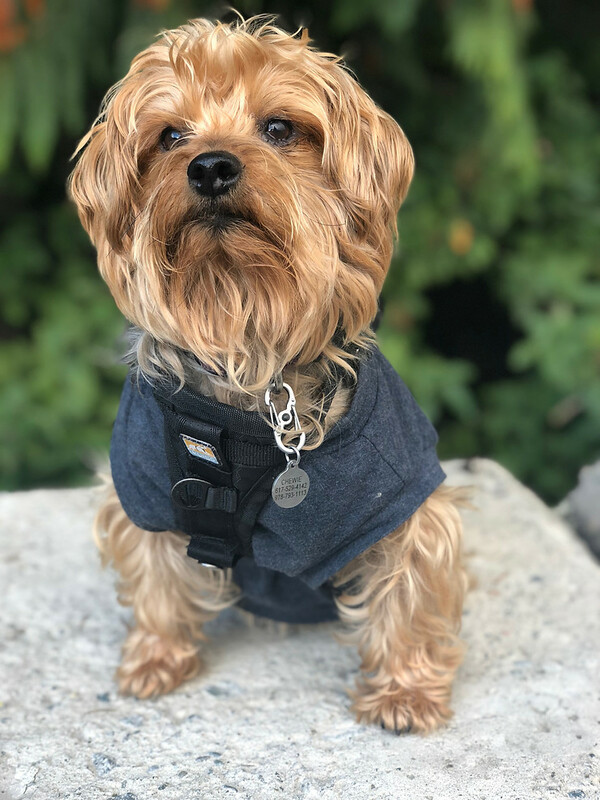 Happy 5th birthday Chewie! Squamish lies just down the road from Whistler at the mouth of Howe Sound, a little tendril of the Pacific Ocean reaching inland, giving access to both the mountains and the sea. 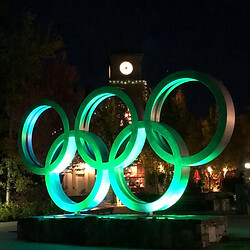 Owing to its location halfway between Vancouver (expensive) and Whistler (expensive), it is very much a town in transition, looking to redefine itself as people flock there in search of affordable housing. 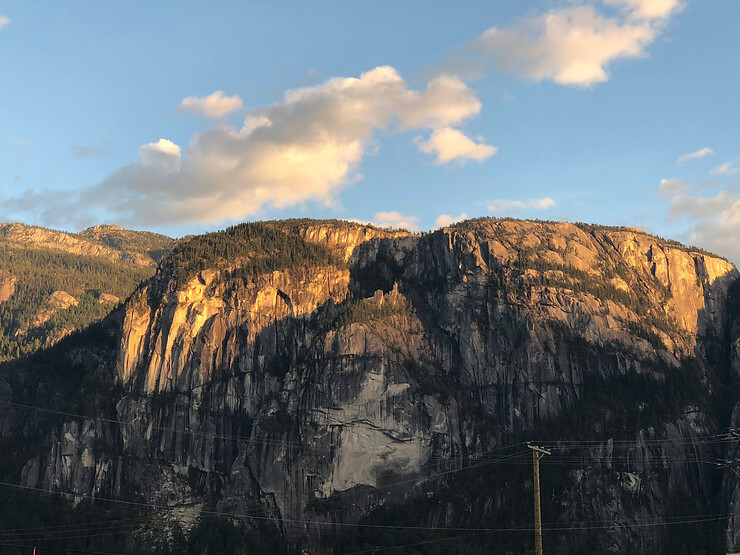 The defining feature of Squamish is most definitely the Stawamus Chief, a towering granite massif that overlooks town. Its summit is visible from almost everywhere in town, and if you look really closely you can see people scaling the walls and on top. Given that the view from up there looked incredible, we found ourselves at the trailhead, hiking boots on, ready to conquer it ourselves. Now, this hike is not for the faint of heart, lungs, or legs. It climbs 2,000 feet in less than 2 miles with an average grade of 25%. That, my friends, is a recipe for a bundle of hurt. We pushed through it, up every single stair, scaling the chains near the top, until we too were standing at the summit. We took our photos, had a snack, and crawled to the edge to peer over before starting the journey down. Somehow, even with the assistance of gravity, the way down proved harder than the way up. By the time we reached the bottom both of our legs were shaking from all of the steps down, and while I faired pretty well the days after, Ashley was just about crippled. 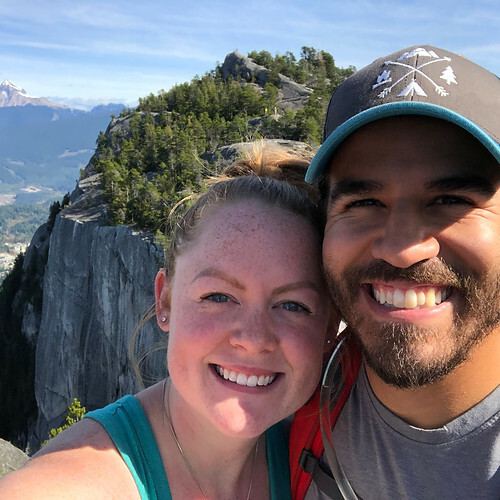 Despite the physical exertion and toll this hike took on us, it was well worth it and we would highly recommend it to anyone in the area. Not having had my fill of MTB in the area, I decided that I once again needed to rent a bike and hit the trails. 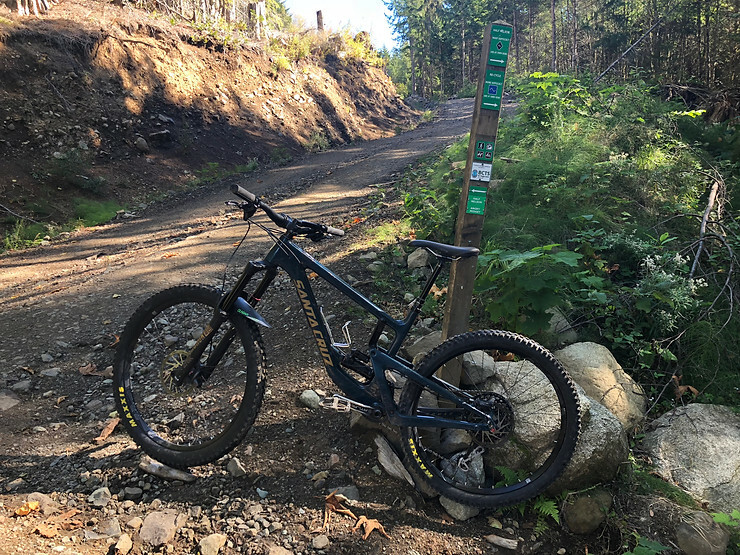 This time around I grabbed something a bit more gravity oriented, a Santa Cruz Nomad, and was shuttled by my beautiful, generous, lovely, and selfless wife up Girabaldi Park road to access some of the famous north shore trails. 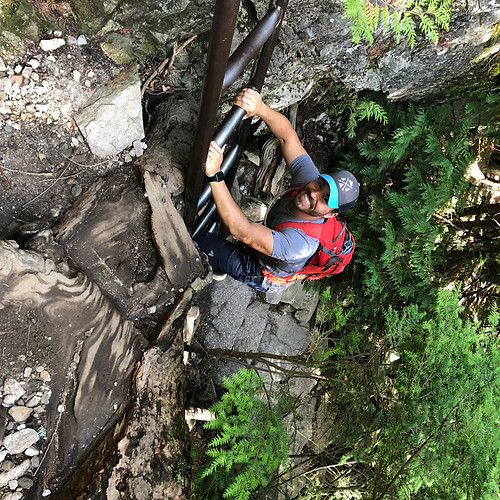 After finding my bearings (Get the Trailforks app for Canada, it has the best, up to date information for MTB trails), I climbed the fire roads and descended the Full Nelson trail. 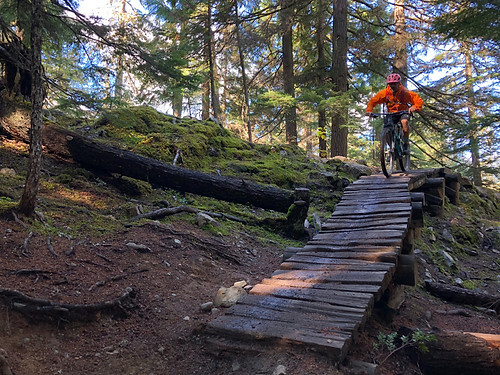 This trail was an absolute hoot, a roller coaster of bermed turns, whoops, and little jumps. Finding myself at the bottom far too soon I climbed up again to do a lap of another famous trail, Angry Midget. Angry Midget is a departure from the flow of Full Nelson; instead it harkens back to the days of natural, chunky, steep trails. Lap 3 brought anther round of Full Nelson before I downed my single snack for the day and headed back into town. Trailforks showed a network of trails just down the road that would more or less deliver me to the doorstep of the bike shop, so I decided to take those since it was mostly downhill from there. This decision would prove to be a grievous error as the “trails” that dropped back into town turned out to be overgrown, loose, nearly unrideable, and quite a bit more uphill than I thought. With no other recourse, I slogged through it, pedaling into the bike shop just in time to return the bike. It was a ride to remember, both for the good and the bad, and it was a fitting end to an MTB experience that was a long time coming. The next day brought rain, and with it our departure. Next up on the list, Vancouver and Vancouver Island!